When Emily first got in touch after finding me on Instagram she said “I’m probably doing this all in the wrong order as I don’t have a venue or a date yet”. Well, it just goes to show it doesn’t matter what order you do it in – it all came together just fine. In fact, better than fine. It all came together beautifully. Emily wanted to get married in the Chew Valley and she found an amazing wedding venue in The Grange at Belluton. 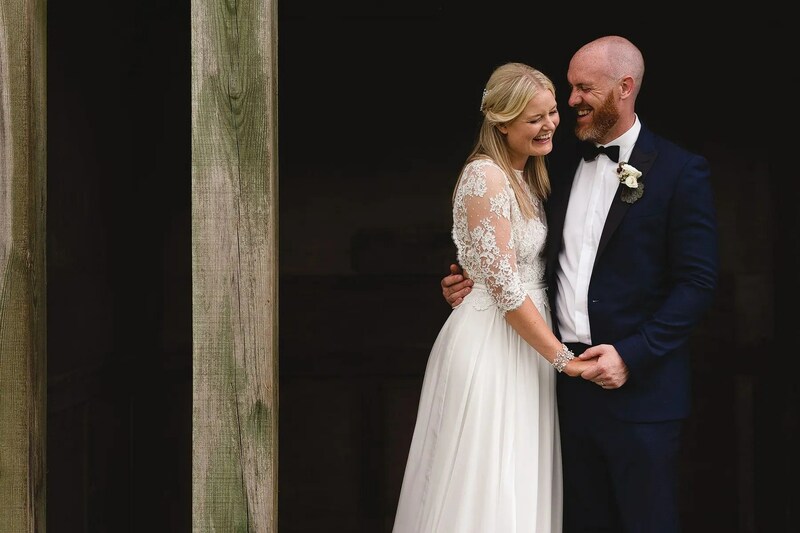 She pulled in a whole load of brilliant suppliers to make the day incredible – and I got to photograph it all. Happy Sam! I started the day at Emily’s mum and dad’s house near Chew Magna. The lovely Grace was doing her makeup and pretty soon Anna from Indigo Yard Floral arrived with Emily’s bouquet. The flowers throughout the day were absolutely beautiful, Anna did an amazing job (check out her insta to see more of her work!). Once Emily was ready I hot-footed it down a couple of country lanes to the church. 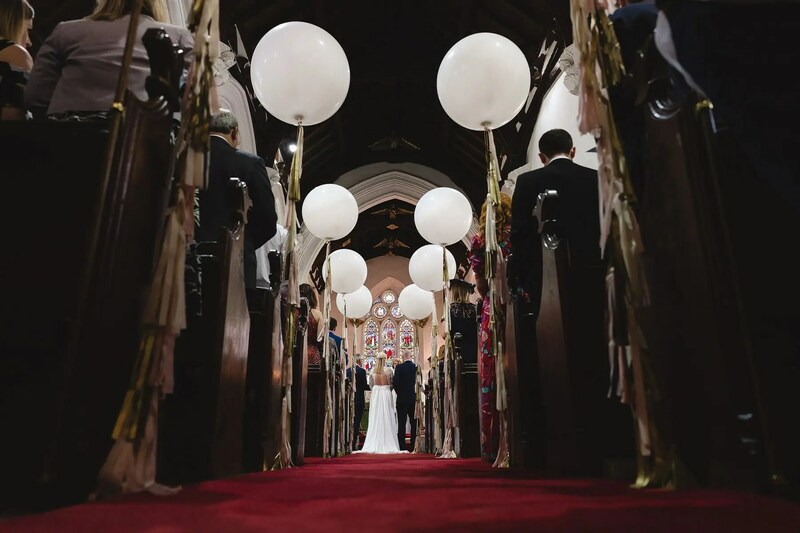 And it looked fantastic – Emily had wanted the aisle decorated with these large white balloons and it really gave an extra wow as guests arrived. The brilliant Steph at Sweet & Pretty had done the decorating at the church as well as everywhere else! I met Chris at the church and he seemed pretty relaxed, joking and laughing with his best man. Before long, Emily arrived in a little morris minor as the sun peeked out from behind the clouds. The ceremony went off without a hitch and after a shower of confetti we all headed off to the beautiful surroundings of The Grange at Belluton. The tipis in the grounds looked amazing, especially with more of Anna’s flowers decorating them. Guests arrived to the sounds of live music wafting over the hills and everyone settled in for a good time. The deckchairs on the lawn were put to good use as was the cocktail bar in the greenhouse! Dinner was by the always awesome Pieminister Weddings (who doesn’t love pie and mash?!) and we were treated to a gorgeous sunset and amazing views out over the valley. I had such a great time with Emily and Chris. They had a fantastic day and you could just see it on their faces all day long. Perfect. Love that speech shot with the arms thrown up! 👌🤙 Great stuff! Great photos all round and I love the last one! Lovely images, great story telling.